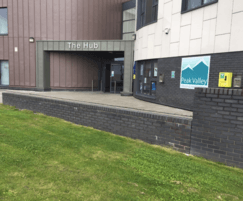 The £4m Hub building in Hattersley, Greater Manchester has been designed as a district centre providing a community centre, library, youth club, police post and cafe for the local estate. The centre required a robust waterproofing system for a leaking podium deck at the entrance which resulted in high volumes of water entering the underground parking facilities at multiple points. 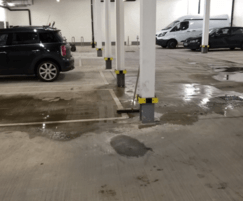 Underground car parks are by their very nature exposed to moisture and water ingress due to the typical environment they exist in and as a result some moisture is tolerable (Grade 1 BS8102:2009). Delta Registered Installer, Timberwise was approached by the customer to provide a guaranteed, cost-effective scheme that would comply with both BS8102:2009 and any requirements of third-party warranty providers. The project commenced by removing all flagstones from the area. Attention was given to the wall floor junction / fillet seals to building perimeter and inner perimeter walls. Angles are potential stress points for waterproofing systems. These crack endangered areas require special attention. 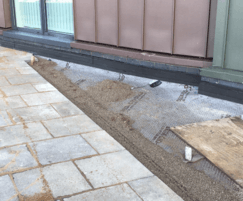 Using a special expanding mortar ‘Koster Repair Mortar Plus’ it is possible to transition the waterproofing products over these awkward angles without danger of the products being applied with disproportional thickness or cracking. Furthermore, the crack bridging properties of flexible waterproofing provides security for these inherently difficult junctions. Koster Polysil TG 500 was applied to both the junctions slab and fillet. Koster Polysil TG 500 is a free lime and salt encapsulating primer that actually modifies mineral surfaces and effectively consolidates the surface where waterproofing is to be applied. This ensures that the waterproofing layer can bond effectively to all types of concrete, stone and brick. An initial application of Koster Deuxan 2C was applied to the external perimeter wall and deck. 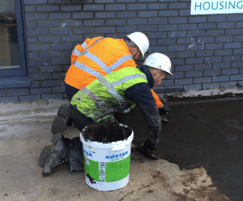 Koster Deuxan 2C provides a completely impervious layer that bonds over the whole surface removing issues associated with jointing during the installation process. A glassfibre mesh was incorporated into the first application of Koster Deuxan 2C prior to a second coat application. The combination of Deuxan 2C and glassfibre mesh provides crack bridging properties. 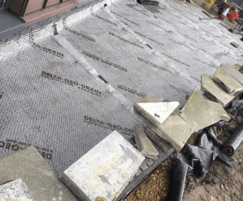 Deuxan 2C is as versatile as it is effective in providing a robust waterproofing solution. The final stage was to overlay the Deuxan 2C with Delta Geo Drain Quattro to the external perimeter wall. Delta Geo Drain Quattro is designed to drain excess water away from a structure, offering further protection. In this instance the fabric of the building, including imbedded structural steels, are now protected for the future as are the cars in the underground car park. 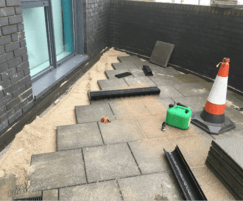 External contractors were left to carry out the landscaping and surface water drainage connections. 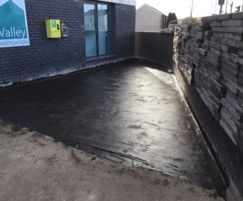 Timberwise completed the project effectively and efficiently leaving the client with dry, usable underground parking facilities.